In the summer of 2014, tens of thousands of Hong Kong citizens, mostly college age, staged a series of pro-democracy protests, bring central Hong Kong to a standstill. These were the largest protests since Britain gave up its Hong Kong colony in 1997, returning it to Chinese sovereignty. It was also the worst and bloodiest police violence in Hong Kong since 1997. The police attacked the protesters with tear gas, and the protesters defended themselves with umbrellas to protect themselves from the tear gas. 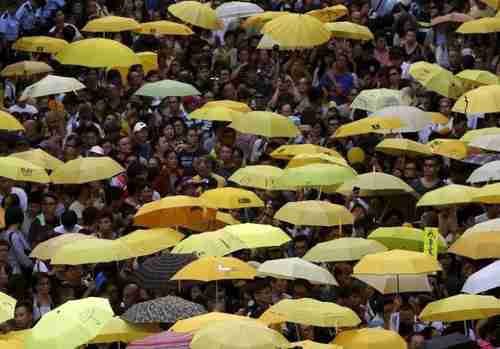 The sight of bright yellow umbrellas became commonplace, and the protests have become known as the "Umbrella Revolution" or "Umbrella movement." What sparked the Umbrella Movement was that Beijing reneged on its commitment to "one country, two systems." According to the agreement that China made with Britain in 1997, when Britain returned its Hong Kong colony to Chinese control, Beijing would pursue Communism and Socialism, while Hong Kong would retain its democracy, its capitalist system, and its way of life for at least 50 years, until 2047. However, for the approaching 2017 elections, China is calling the elections "free," but is tightly controlling who will be permitted to run in the elections. The only candidates who will be permitted to be run have to be approved a "nominating committee" completely controlled by Beijing. So the effect is that the so-called "free" elections are rigged to guarantee that only candidates selected by Beijing can win the elections. The Umbrella Movement is considered a complete failure, because nothing changed. China adamantly refused to make any changes to the 2017 election process, and so it's still absolutely guaranteed that the so-called "free" 2017 elections will be tightly controlled, and any candidate that wins the election is also guaranteed to be tightly controlled by Beijing. According to 25-year-old Edward Leung Tin-kei, who took part in the Umbrella protests, "I was a peaceful protester. But what have we achieved? Nothing." The failure of the Umbrella Movement caused its young generation leaders to reevaluate their motives and what risks they're willing to take to achieve their goals. However, it was an event several months ago that really galvanized the rise of the independence movement. Several Hong Kong booksellers who had been selling pro-democracy books in their bookstores disappeared mysteriously in October of last year. Although it was widely believed that Beijing had abducted them, there was no proof until June of this year, when 61-year-old Lam Wing-kee, one of the booksellers, suddenly surfaced in Hong Kong and held a press conference, saying that Chinese agents had abducted him. "They blindfolded me and put a cap on my head and basically bundled me up." He gave a detailed description of what happened. He was arrested after crossing the border from Hong Kong into the southern mainland Chinese city of Shenzhen in October, and was kept in a 200 sq ft room for five months under guard. He was forced to sign a document admitting to crimes that he hadn't committed, and giving up his right to a lawyer or to speak to his family. Eventually he confessed to his "crimes" on television, and then was released on bail. His press conference was a complete surprise to everyone. He said he had decided to speak out after thousands of demonstrators took to the streets of Hong Kong to protest the booksellers� disappearances. "Hongkongers will not bow down before brute force," Lam said. Four other abducted booksellers are still in Chinese jails. This is not just an ordinary detention. This is literally a kidnapping by Beijing authorities." In July, the Hong Kong administration disqualified six potential candidates with pro-independence stances from running in the 2016 Legislative Council election. Earlier this year, any talk of Hong Kong independence was completely unthinkable. But the disqualification action led, in early August, to the first pro-independence rally in Hong Kong history. Pro-independence activists are now referring to themselves as "localists." A poll last month showed that one in six Hongkongers supported independence. "Hong Kong�s sovereignty doesn�t belong to Xi Jinping, the Communist Party, the Chinese or local governments � the sovereignty always belongs to us." "From mainstream society in Hong Kong to Beijing, there is awareness that Hong Kong independence should not be given any credence. However, some political forces in Hong Kong have tried to make use of these calls to serve their own ends. Meanwhile, other dissenting sentiments may also expand by riding on the extreme independence wave. These have created room for the Hong Kong independence farce to grow. The Hong Kong authorities have realized that it is time to set systematic restraints. The general public in Hong Kong has also acknowledged the harmful effects. Such things as Hong Kong independence can by no means be tolerated in the mainland. But under the Hong Kong system, odd things are never a surprise. The West would like to see a farce, but its own farces may be more eye-catching." So it's America's fault. Nothing new there. Beijing is trying to crush the pro-independence movement by disqualifying candidates and by acting like Mafia gangsters, abducting booksellers of all people. The Beijing politicians are just stupid as politicians in the west. They think that they will stop protests by college age students by abducting booksellers. Is Xi Jinping a total idiot? Do these Chinese officials have no sense of their own history? Do they think that Mao Zedong would have been stopped if Chiang Kai-shek had abducted some booksellers? "Don�t worry. All this talk of independence by Hong Kong�s younger generation will fizzle out in time. Anyone who tells you that is either an idiot or takes you for one. A political cause dies only when the reasons that spawned it no longer apply. But the reasons that lit the independence fire still remain. In fact, more have materialized, convincing young people that independence is a wall that can guard against mainland culture invading Hong Kong. You can�t blame them for thinking that way when they see booksellers being abducted, their peers being blocked as Legislative Council candidates for their political beliefs, and Beijing loyalists demanding a ban on independence talk in schools. Yes, Hong Kong independence is fantasy, but when so many believe fantasy can become reality, the worst thing you can do is to dismiss it as a passing folly. Trying to choke it with tactics that go against Hong Kong�s values won�t work either." With the independence movement growing in Hong Kong, authorities fear protests and violence during the Legislative Council elections to be held on Sunday. Kowtowing to Beijing, the Hong Kong administration had disqualified six potential candidates from running, on the grounds that they may support Hong Kong independence from China. About 40 officers [on the morning shift] will be sent out in case of any trouble in their police district. Another 30 detectives working in each of the stations will also be deployed in case of any major unrest."